TAOISEACH Enda Kenny has said he'll make his intentions about his future leadership of Fine Gael "very clear" once he's "happy" with the ground rules for the EU's negotiating position on Brexit. Meanwhile, Mr Kenny said he can understand why British Prime Minister Theresa May called a snap election to strengthen her position ahead of the crunch talks. 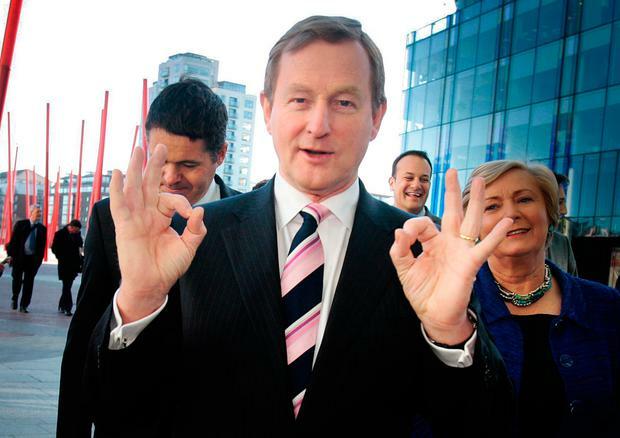 Mr Kenny was asked if he will still be in office to congratulate the winner of the UK election in June. He said: "I always congratulate people on many things". And he added: "I’ve already made my position very clear that once I’m happy with having the ground rules for Brexit in place I’ll make my intentions very clear." The EU's negotiating guidelines could be agreed as early as Saturday next week at an EU Council meeting in Brussels. Mr Kenny refused to say if there will be a new Fine Gael leader in office at the end of the current Dáil term this summer. "I've already said in respect of making my intentions clear. "I want to deal with this matter next Saturday and hopefully we get clarity about that... and then make my intentions very clear after that". Mr Kenny was also asked if there is hope that the calling of the election in Britain could result in a a softer Brexit. He said: "I can understand as a politician why the Prime Minister would decide to seek a mandate from the electorates of the UK to strengthen her position... in entering into negotiations for Brexit. “Obviously it’s going to cause quite a deal of angst I would think, particularly in Scotland and there will be a different political impetus from Northern Ireland out of this." He said the political battle ahead in Britain is "a matter for the electorates of the UK". But he added: "I do think that if as expected the Prime Minister gets an enhanced majority it strengthens her position as the Prime Minister in conducting the Brexit negotiations. Mr Kenny said it should be pointed out that Mrs May "has been very clear that she’s not negotiating on the basis of a hard Brexit." The Taoiseach was speaking after a meeting in The Hague with the prime ministers of the Netherlands and Denmark, two of the other EU countries expected to be worst hit by the impact of Brexit. Mr Kenny used the occasion to discuss the strategy for the upcoming talks on Britain leaving the EU with Dutch leader Mark Rutte and Danish prime minister Lars Løkke Rasmussen. Ireland, the Netherlands and Denmark share a range of common interests in relation to Brexit, including strong trading relations with the UK. Both Mr Rutte and Mr Rasmussen referenced issues important to Ireland. Mr Rutte said that the priority for the beginning of the Brexit talks should be to "deal with financial matters with border issues." Mr Kenny thanked both prime ministers for their understanding of Irish issues including the "question of the Irish border which is unique in being the only land border in the European Union after Brexit is completed." Mr Rasmussen said the UK's intention to leave the Customs Union "risks a lot of unnecessary bureaucracy and a lot of barriers to trade. "We will need to lead with those issues including the particular problem which Ireland will be confronted with and I hope we can find fair and pragmatic solutions," he said. Later Mr Kenny explained that he came to The Hague to meet the two leaders: "because we have similar interests of a very common nature". He added: "We wanted those reflected in the ground rules being set out by the European Council, not to be seen as some sort of breakaway group, we are part of the 27."